I had a metal layer of bus signal which i wish to calculate the effective resistance of this layer. Please see the attachment file for the layout. Can i just calculate the whole rectangle and minus the the empty space to get the effective resistance? will it be accurate? As far as I've correctly understood your question, I don't agree neither with you formula nor with the formula of erikl. 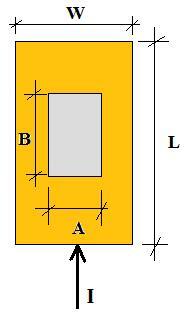 The DC resistance of a metal sheet is given by R=ρ*L/A where ρ is the resistivity, L the lenght along with the current flows and A is the cross-section. Is the sheet has thickness T, and width W then A=W*T from which: R=ρ*L/(W*T). Now we can define the sheet resistance as Rs=ρ/T so that the total resistance can be written as: R=Rs*L/W. Then a first problem is to know if in your case the current will flows along X or Y. If it flows along Y, then R=Rs*Y/X otherwise R=Rs*X/Y. 3) depends from the shape of the holes. Last edited by albbg; 29th November 2013 at 00:21. You are right, albbg. In any case there must of course be a + sign after the (L/W) term, not a - sign. Thanks for your attentiveness and correction! This is a good zero-order model / formula. In fact, in structures with holes (slots) the current flow is never uni-directional - the current will flow around the holes, creating 2D patterns of current flow. 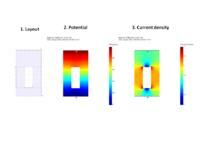 I did a quick simulation of a similar structure - here is the layout and simulation results (potential and current density plots). Resistance calculated by the formula (sheet resistance of the metal was set to 50 mOhm/sq) is 0.1125 Ohm (there are 2.25 effective squares), while numerical simulation gives a resistance of 0.1179 Ohm. The difference is ~5%, not much (for most purposes) - but can be higher, depending on the layout. In fact, the layout shown in the original post looks like a part of power net or power transistor. Resistance is only one part of the problem, the other one is current density (electromigration). 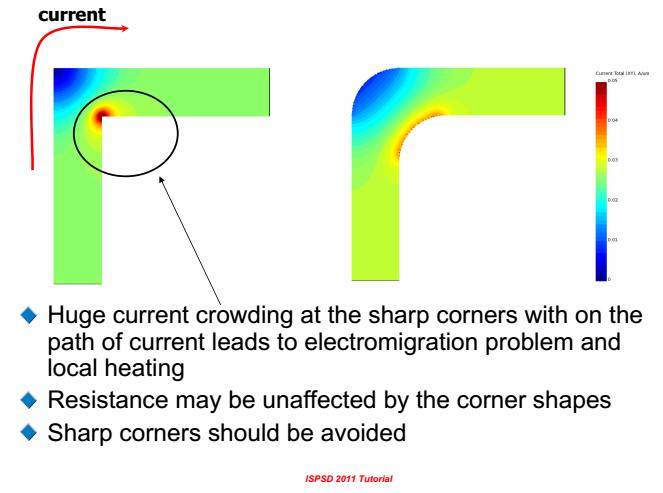 To minimize current density, one should avoid placing slots on the path of high current density, avoid having large current going around a sharp (e.g. 90 degree) corner, etc. etc. 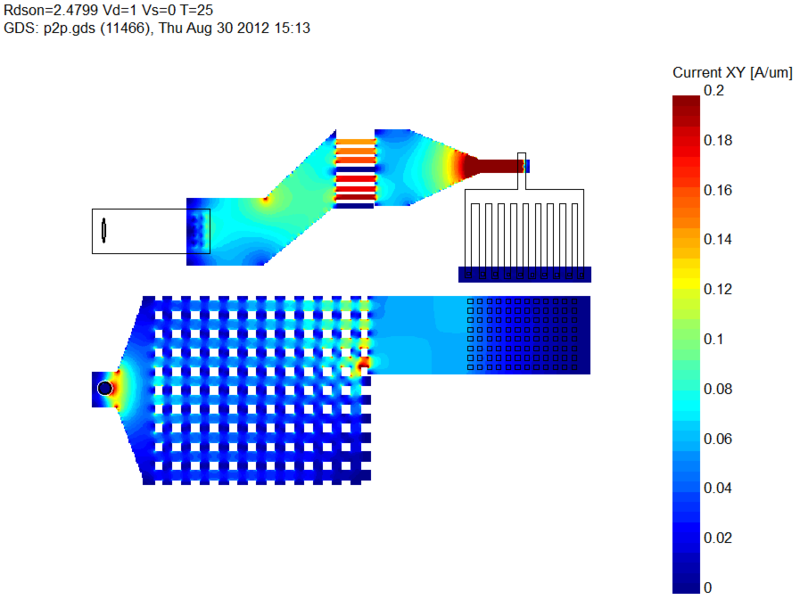 Performing a mesh-based simulation (like the one shown above) helps to understand how the current flows, and to optimize the layout to minimize current density and resistance. Sometimes, you should not minimize the resistance, but to route the current in a balanced (i.e. uniformly distributed) manner - by providing current ballasting mechanisms (meaning - adding some resistance somewhere). Thanks to litho dispersion - even with phase masking - we never achieve such sharp corners on silicon. And if we had them, nevertheless, say in a 1µm process - wouldn't electromigration round them after some time - really high current densities assumed? Thanks to litho dispersion - even with phase masking - we never achieve such sharp corners on silicon. wouldn't electromigration round them after some time - really high current densities assumed? Not necessarily - if you create a perfect layout, from current routing / ballasting viewpoint - there will be no burnout due to electromigration in the first place. With electromigration burnout - this process may or may not stop. 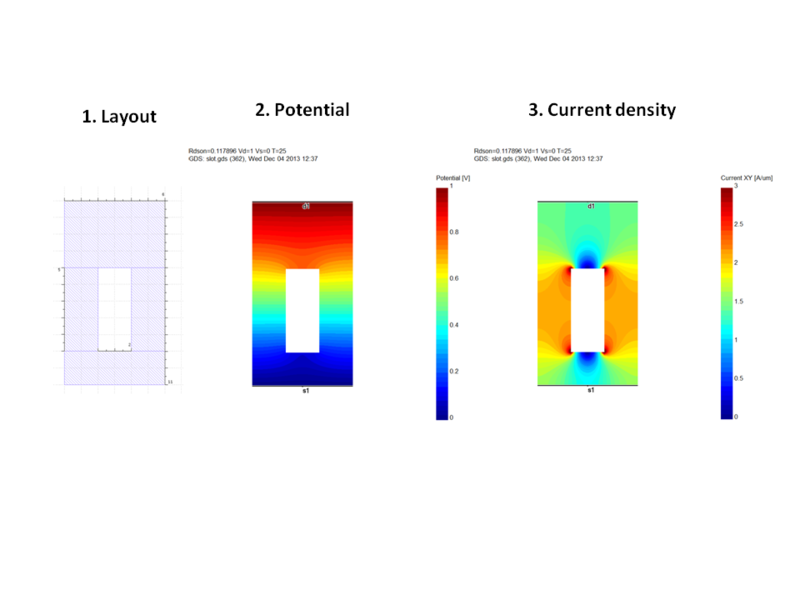 Imagine a row of contacts/vias with non-uniform current distribution (current is highest in the edge via) - the edge via will burn our first, then the next, and so on. This was a great thread for me trying to understand how R is computed for some simple geometry. Thanks especially to timof for his diagrams that made it all "click". What software can be used to compute those current diagrams and precise R values? I suspect there are several tools, but whenever I search for R solvers it talks about things like StarRC which isn't an exact (finite element) solution, just good heuristic in order to be fast.